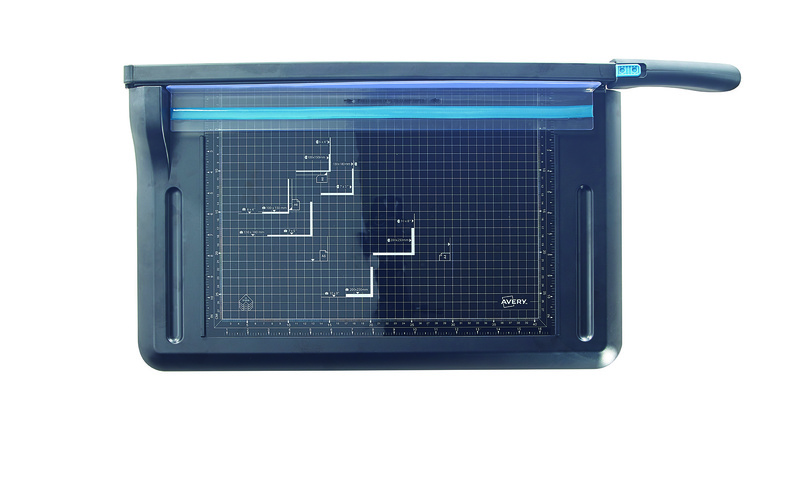 • Durable guillotine for regular use at work or at home. • Self-sharpening hardened steel blade is both smooth and durable. • TÜV certified for safety and quality; a built-in blade locking mechanism guarantees additional security. • Handle remains securely in the upright position for extra safety and easy paper positioning. • Size: A3 (Cutting length: 420mm). This lightweight Avery Office Guillotine features a self-sharpening steel blade, with a unique blade cover for safety. The guillotine also features printed guides for accurate cutting. This A3 guillotine has a cutting length of 420mm and a capacity of up to 15 sheets of 80gsm paper.